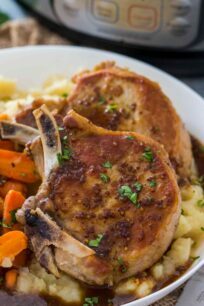 Instant Pot Apple Cider Pork Chops are tender and delicious, easily made into a full meal with mashed potatoes and carrots cooked at the same time in the pot. We love using the pressure cooker to make easy and delicious meals. Among our most popular once are Instant Pot Orange Chicken, General Tso, and Pressure Cooker Mongolian Chicken. Instant Pot Apple Cider Pork Chops are so soft and tender that this might become the only way you cook pork chops going forward. I love a good and easy recipe, and this one, guys, is a keeper. 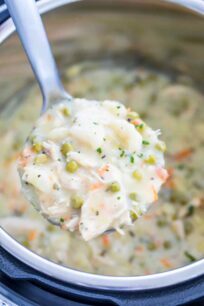 The best part of this recipe is that you can put a full meal on the table with minimum effort and a fraction of the time, all these while using only the Instant Pot so think, minimum pans to clean. The pork chops, potatoes, and carrots are cooked at the same time. Once everything is done, a flavorful and super easy apple cider sauce is made. This delicious homemade recipe is another great combo of sweet and savory, the apple cider mustard sauce has just the right amount of sweetness and slight tanginess to tie this meal together. Astonishingly delicious! Watch the video below with detailed steps on how to make this recipe. For this recipe, I used a 6 quart Instant Pot and I used about 1.5 lbs of bone-in, center cut chops. To make this a full meal, I cooked everything in layers. First one was the potatoes, topped with a trivet on which I placed the carrots and the pork chops. Similarly, this recipe certainly can be made without the side dishes. You can only cook the pork chops. Make sure you brown them, after that cook in the minimum liquid requirement based on your pressure cooker size. Once the chops are cooked and the IP beeps, make sure you do a Natural Release. Do not do a Quick Release, it will toughen the meat. Also, once you remove the meat, you can add the sauce ingredients and reduce them on Sauté mode. Definitely, use stone ground mustard for the sauce, it will add amazing flavor. I find 15 minutes to be enough cooking on High Pressure for 1.5 lbs of center cut chops, which comes down to about 3 pork chops, that measured about 1 inch in thickness. If you want the meat to be so tender that it falls off the bone, you can increase the cooking time to 20 minutes. I like 15 minutes on HP with a 15 minute NPR makes the perfect tender meat. WHAT IS THE SECRET TO MAKE JUICY Instant Pot PORK CHOPS? Using thin cut pork chops can result in dry meat. Since the chops will be cooked under pressure, the meat tends to dry out if it is thin cut. Also, it might not have the best look to it. The best alternative to cooking the thin cut pork chops would be cooking them on the stove top. If you prefer eating boneless pork chops, make sure to use thicker size cuts. It will result in tender and juicier meat. It’s important to note, that the meat is done when it reaches an internal temperature of 145 degrees F.
This is what we usually use, and is what makes this dish so special and juicy. 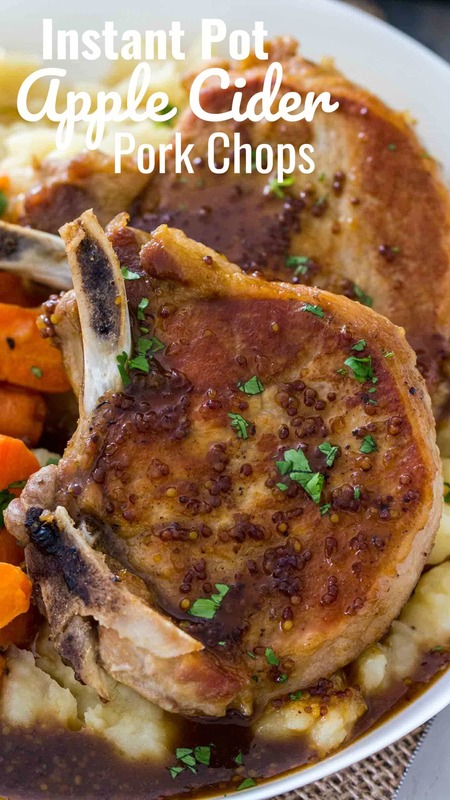 Try to use bone-in pork chops, this results in a flavorful and tasty meal. Similarly, the bone-in helps insulate the meat and keep the chops tender, juicy and very moist. What to serve with Apple Cider Pork Chops? A Natural Pressure Release means that the pressure is released gradually. For a Natural Pressure Release, you click on Keep Warm, and wait 10 minutes, after which you open the valve and let any leftover pressure to release. Another option is to Turn Off/Unplug the pressure cooker, wait 10 minutes and after that open the valve. A natural release is usually used when cooking soups, meat in a large amount of sauce, pasta or steel cut oats. This method prevents for any foam from the dish to shoot out through the valve, which can happen during a Quick Pressure Release. CAN YOU FREEZE the PORK CHOPS? Absolutely! Just make sure, before freezing that the meat is completely cooled. Then, transfer it into freezer-safe containers or heavy-duty freezer bags. Lastly, label with the date, and freeze for up to 3 months, or longer if you use a deep freezer. Season the pork chops with salt and pepper on each side. Turn on the Instant Pot and select Sauté. Once it reads Hot, add the canola oil, wait about 1 minute for the oil to heat up and add the pork chops to the bottom of the pot in one layer. If needed brown them in batches. Cook the pork chops on each side for about 2-3 minutes, until golden brown. Remove to a dish and cover with foil to keep warm. Add the peeled and quartered potatoes to the bottom of the instant pot. Add the chicken broth. Place the trivet that usually comes with the IP on top of the potatoes, a steamer basket will also work. Add the carrots. You may add foil to the trivet, to prevent the carrots from falling thru the spaces. Poke a few whole with a fork into the foil for steam to circulate. Add the pork chops on top of the carrots. Close the lid. Seal the valve. Select High Pressure and input 15 minutes. Do 20-22mins if the pork chops are very thick. Once the Instant Pot beeps and the cooking time is zero let the pressure release naturally for 10-15 minutes. Open the lid, remove the trivet with the pork chops and the carrots, add them to a plate and cover with foil to keep warm. Drain the broth from the potatoes into a cup. Transfer the potatoes to a bowl. Start mashing the potatoes and add broth little by little, until they are the consistency you desire. You can also add milk or cream instead of the broth. Just do it little by little. Season the potatoes with salt and pepper. Cover the bowl with foil and set aside. Clean the Instant Pot bowl and select Sauté. Once it reads Hot add the apple cider, brown sugar and stone ground mustard. You can also stir in the mustard at the end. Cook to a thick, syrupy glaze, stirring occasionally and until reduced by about half. Stir the stone ground mustard now if you didn't at the beginning; season with salt and pepper. To thicken the sauce quicker, mix in a cup cornstarch and water until fully dissolved, and add the mixture to the sauce. Stir to combine and simmer. 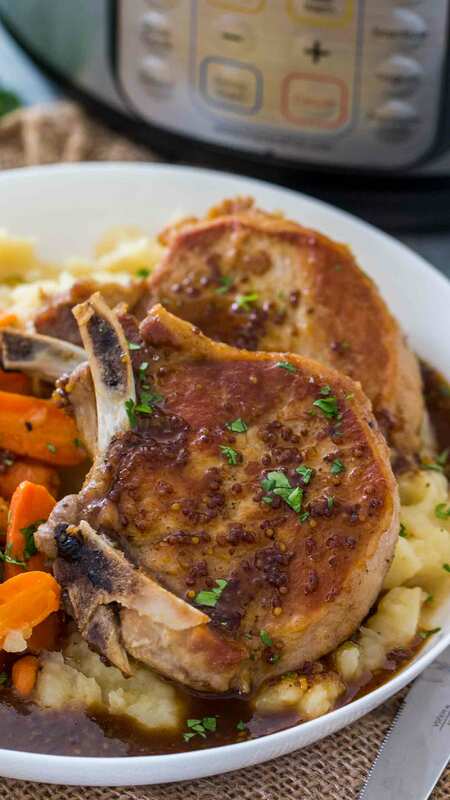 Serve the pork chops with mashed potatoes, carrots and top the meat with the glaze. 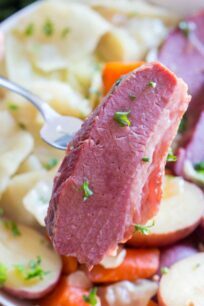 I had no idea that you could make such gorgeous golden chops in the Instant Pot! A must try for sure. I love easy, delicious, and flavorful meals made in the IP. I haven’t tried pork chops in the IP yet….looks like that needs to change! My husband is going to be so excited! I can’t wait to try this in the IP!! Sounds SO delicious!! Such a perfect meal! My family definitely love this IP recipe! I am going to have to try these out! They look so good! Looks like a fabulous meal to try in my instant pot! Can you substitute for bone-in chops to boneless? Can you Substitute bone in pork chops with boneless chops? yes, make sure they are thick. Made thick chops tonight with potatoes. No carrots. Turned out amazing. Tender. And delish. Just thickened the broth into gravy and served over chops and potato chunks. Did 22 min pressure and 22 min. NPR. Love these Pork Chops! I am a novice cook to say the least and this was the first meal that I made with my new IP. I did it, and they tasted amazing! So tender and the glaze sauce was to die for! Hi Karen, glad you liked it! and yes it works great with other meat parts! What about pork steaks? Can this be done with them? Delicious recipe! I added a touch of salt to my glaze as the brown sugar and cider mixture was insanely sweet, which turned out amazing! I made this it was so easy and delicious i made it twice in a week. Can I use powdered mustard or regular yellow mustard in a pinch? It will not taste the same, I don’t really recommend it. I made this recipe tonight my wife and I really enjoyed it. Everything was cooked well and we both enjoyed the sauce. Thank you Pat, so happy that you enjoyed it! The food was delicious (oh my goodness, the potatoes!) but my glaze refused to thicken and the mustard wouldn’t mix in, it kept separating. Any thoughts? Next time add a mix of cornstarch and water 1 tablespoon cornstarch and 2 tablespoons water, mix in a small bowl until fully combined and add to the pot, this should help thicken it. Did you use enough sugar? Usually that is the problem. 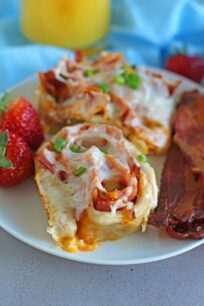 We absolutely loved this recipe! I made the mistake of buying boneless pork chops instead of bone in. Think it’ll make a difference? Ran out of potatoes. Has anyone done this JUST cooking the pork chops alone? Not sure what to do for the liquid. I’m just trying it by add 1/2 cup of broth in. Use same liquid quantity and use it to drizzle it on the pork chops. Could I substitute butternut squash for potatoes? Thanks! Amazing dish! I used the sauce for dipping because I stupidly/accidentally used apple cider vinegar! 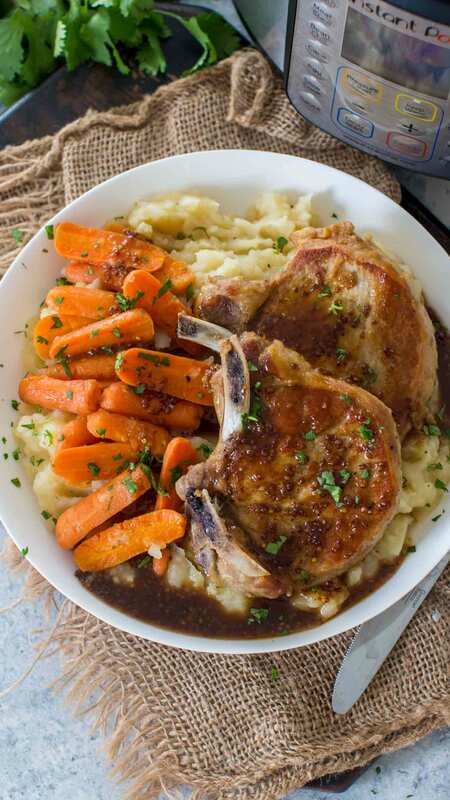 Pork chops tender, carrots naturally flavored from being under the pork, and those mashed potatoes! All items I got from the farmers market on Tuesday – including the pork. Will try again with the correct sauce ingredients. We are traveling in an rv for 6 months and I am learning about the virtues of less is more, lol, as far as packing goes. Just made this, my second ever IP meal, and omg. Easy and delicious. I added rosemary, garlic, a dash of cinnamon and nutmeg because I can’t imagine a pork chop without those spices/herbs. So tasty! Thank you. Also, Catalina, your photo is as beautiful as your name. I have a large, hungry family, and use the 8 quart IP. If I use 8 chops, how will I need to adjust the cooking time? technically no, the time usually stays the same. Awesome meal. Made it with sweet potatoes instead and the kids loved it. Always a win if the picky four year old eats. I only had two large pork chops an inch thick. The center was a little dry. When you say natural release my book says to turn off and time it. Your direction seem to allow the pot to go to warm and let the timer count the minutes. (and that is what I did) I wondered if I might have cooked them too long. Will try again loved everything in one pot and the flavors were very good. Just finished this savory dish for dinner tonight! Compliments all around. Only thing I did different was use Dijon mustard instead of stone ground…worked well. Ended up using the apple cider sauce on carrots too. Thanks for a great ‘go to’ recipe! is it possible to double the recipe? 3 chops won’t be enough for my family.. My IP is only a 6qt so, I’m not sure if that would be too much in there, if I went for 6 chops. What do you think? should be enough space for 6 chops. do you recommend cooking in the IP? Hello, if it’s thicker up to about 2 inches, I would increase the cooking time by 2 minutes or so. It should be enough for it to properly cook. Thanks for stopping by!